Until 1840, German-speaking Catholics in Pottsville had monthly Mass said by a Jesuit priest, Father Nicholas Steinbacher who rode on horseback from Reading to hold services in the basement of St. Patrick’s Church. Available records do not say when Father Steinbacher began his visits, which he alternated with trips to Lebanon, Elizabethtown and Gettysburg, but they ended when his horse broke a leg during one of his trips to Pottsville. The founding of our parish was a combination of Father Steinbacher’s misfortune and possibly a bit of cultural misunderstanding. An early history of St. John the Baptist parish reports that two young men, namely Henry Ackerman and another recalled only as “Mr. Dusch”, were “politely” turned away from a crowded Mass at St. Patrick’s one Sunday because it was not being celebrated for Germans. So the two called a meeting on August 19, 1840 at the home of George Dusch (it is not clear now if he was, in fact, the “Mr. Dusch” who had been turned away) to form their own German parish. God works in mysterious ways and from such inauspicious but determined roots springs the history of our parish. Over the last century and a half, the barriers created by language and ethnic distinctions have dissolved. In August 1840, two dozen men selected St. John the Baptist as the patron for the new congregation. At the time there were about 27 German-speaking families and a few single men scattered from Mount Laffee to Schuylkill Haven, and from Minersville to Brockton (known as Patterson) who were interested in building a new church. On January 20, 1841, the Diocese of Philadelphia accepted a deed from the fledgling congregation for the lot at Fourth and Howard Avenue where they planned to construct the church, formally recognizing their intentions. In June 1842, the cornerstone of the church was set in place, and blessed by Father Steinbacher. Then women and men worked together constructing the church during late afternoons and early evenings, carting stones in wheelbarrows from the side of Sharp Mountain, and carrying water by buckets to mix mortar needed to cement them together. By November, work was far enough along that Father Edward Maginnis of St. Patrick’s was holding services in the unfinished building, although the onset of cold weather forced a halt to the construction. It also gave the parishioners an opportunity to petition Bishop Francis P. Kenrick for a German-speaking priest. On November 10, Bishop Kenrick appointed Father Joseph Burg, a native of Hungary, as the first pastor of St. John’s. Father Burg arrived in Pottsville on December 10. Five days later, he baptized Louisa Lippe, the daughter of Adolph and Theresa (Eichorn) Lippe, and William Eberle, the son of Peter and Anna (Wahl) Eberle in the unheated church – the first baptisms in the church. Bishop Kenrick held the first recorded confirmation in the church, a class of 100, on October 5, 1845. Two years later, on September 5, 1847, the bishop confirmed 66 more, while Father Burg, who died January 16, 1849, was still pastor. At the time, the stone building was unfurnished as well as unheated. Parishioners who lived nearby brought their own chairs and benches for visitors. Parish women built a fire in the church on Saturday nights to warm it for the next morning’s Mass. The Rev. Peter Maria Carbon, a 26-year-old native of Alsace, France, succeeded Father Burg, and served as pastor for 19 months until his transfer to St. Peter’s Church in Reading in July 1850. It was during his pastorate that the congregation resolved to build a one-room school for their own children. Opened in September 1850, the school was run by a succession of nine lay men over a period of 23 years. Father Daniel Oberholzer, 40, a Swiss Capuchin, succeeded Fr. Carbon as pastor. Because he believed that part of the cemetery behind the church was needed as a vegetable garden, he purchased the first two acres of the current cemetery at 20th and Mahantongo Streets for $716 in January 1853. This led to a confrontation with some of the parishioners, whom he believed in an effort to oust him as pastor, claimed the new cemetery was too distant from the church; their real intention was to become trustees, with control over the administration and finances of the congregation. The dissidents purchased ground between Eighth and Ninth Streets for a competing cemetery. This prompted Father Oberholzer to send a written explanation of the controversy to Bishop St. John Neumann before resigning as pastor on May 20, 1856. Two days later, Bishop Neumann named an Austrian, Rev. Philip Wegmayr, to replace Oberholzer. Father Wegmayr served as pastor (and under him the parish was assigned its first assistant pastor, Rev. Matthias Joseph Meurer) until the bishop ordered the church closed on May 6, 1858, because the dissident cemetery group refused to deed their land to the diocese. St. John’s remained closed for seven months until the dissidents, as old history recounts, “were disposed to comply”. On December 14, 1858, St. John’s reopened under its sixth pastor in 16 years, the Rev. Francis Louis Neufeld. Father Neufeld had been ordained only two weeks earlier. He was succeeded after four years by the Rev. Francis Joseph Wachter, who selected and purchased the site for our current church from a Mr. Patterson for $10,000 in 1865. Apparently the strong wills among the parishioners had been softened somewhat by the lessons of seven years earlier. A new dispute over the possible location of the new church was quickly settled in an effort to begin construction as soon as possible. Two other sites, one directly across Mahantongo Street from the present site, and one at Seventh and Market Streets, were rejected. The foundation was dug and by the time the Rev. Bernard A. Baumeister, a 26-year-old Westphalian, succeeded Father Wachter in August 1869, the lowest course of Hummelstown brownstone (just above the basement) had been installed. Although no one recognized it at the time, a seminary student named Frederick William Longinus, who accompanied Father Baumeister on monthly visitations to collect money to pay for the church’s construction, was later to leave the most indelible mark on the parish. Father Baumeister was transferred to Philadelphia in August 1872, as the new church conglomerate rock, again hauled down the mountain, neared completion. He was succeeded by another Westphalian, the Rev. Herman Depman. Father Depman performed the last marriage (Frederick Vogelgesang to Elizabeth Schmidt) in the old church on October 13, 1872. 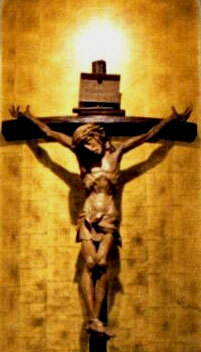 The church consisted of little more than its four bare walls, three altars and pews when Father Longinus arrived. By his death on December 1, 1932, two years into another great national depression, the church had been finished with the spectacular stained glass windows of the German master, Wilhelm Derix, four great bells had been installed in the tower, the walls and ceilings were decorated with the devotional paintings by the German artist Lemprecht, statuary adorned the corners, the building was heated and electrified, a grand pipe organ was obtained from Hook & Hastings of Boston, the Pieta at the front of the church was installed, and a male choir was installed. Father Longinus left behind more improvements in the Church, but to list them would neglect what he did away from the church building proper. Under his leadership, the parish purchased what is now called Pauline Manor, the former convent for the Sisters of Christian Charity on Howard Avenue. The school building behind the church was opened in 1895. The cemetery was expanded and a perpetual care fund was established in 1912. He expanded and renovated the rectory and convent. The former church building was sold and became the Italian parish of St. Joseph’s. When the parishioners presented him with a cash gift on his Silver Jubilee in 1927, Father Longinus purchased the Russell Building and grounds at Ninth and Howard Avenue for $10,500 which he donated to St. John’s as a social center. With his guidance, and that of a variety of assistant pastors, numerous religious societies and sodalities were established or fostered in the parish. At least 70 members of the parish entered the priesthood and other religious orders while he served St. John’s. Many special religious devotions were held through his efforts. The greatest period of stability and growth in the history of the parish, bracketed by tumultuous times in the nation itself, was covered by his pastorate. The bells he had seen installed in the church were tolled immediately after his death, to notify the parishioners of his passing. Parishioners built a catafalque on which his body was laid in state in the church until his funeral Mass, which was attended by an overflow crowd and presided over by John Cardinal Dougherty. One of the parishioners, Joseph Hochgertel, contracted a cold while working on the catafalque. It developed into pneumonia, and he died within a week of Father Longinus. Father Frederick Fasig, who as assistant pastor had administered Father Longinus’ Last Rites, became St. John’s tenth pastor and was the first one born in the United States. The Reading native apparently learned well from Father Longinus; he served as St. John’s pastor for 31 years. His period wove through the woes of the Depression’s final years, the fears and losses of World War II, the race to the moon, the election of America’s first Catholic president, and to the eve of the Second Vatican Council. Under Father Fasig, there were many changes in the parish as well, reflecting the changing times through which he guided St. John’s. The cemetery again was expanded. The number of sisters serving the school was reduced in 1950, and lay teachers were introduced in the school in 1955 after an 80 year absence. In 1950, the same year the number of sisters were cut back, the church was renovated, and stone mason, Jon Gaynor, along with other parishioners, turned the site of an old outside toilet behind the church into a beautiful grotto to the Blessed Mother. The stone for the grotto was brought from Gordon Mountain; the statue was imported from Italy in time for the feast of the Holy Rosary in October. Two years later, the Catholic Women’s Union planted the azaleas that now blaze around the grotto each spring. According to Sister Florecita Horning, a St. John’s native who entered the Sisters of Christian Charity and became its archivist, there was a mild stir in 1959 when a section of ceiling fell down in the one of the Sister’s bedrooms during the night. “Fortunately”, she records, “it was not over the bed”. Father Fasig died March 1963. Two months later, on May 26, Father Francis Fox became pastor. The times were changing and St. John’s changed with them in the 18 years that Father Fox shepherded the parish. The first Mass under the liturgical changes brought by the Vatican Council was held March 7, 1965. Records kept by the sisters indicated that it went smoothly because “everyone was well prepared”. The following year, the church basement again became a schoolhouse as pupils from Mary, Queen of Peace Parish made use of it following the condemnation of their own school building. Grades five and six used the church basement, while seventh and eighth graders were placed in the Russell Building on short notice, until the formal closing of the school in 1968. In 1967, the look of the parish and school changed as the sisters wore the modified habit for the first time. The sound of the church changed also, as the entire student body sang a High Mass for the first time in English. In 1969 the church sanctuary was renovated and a new parking lot was constructed behind the Russell Building. Seven years later on October 17, 1976, 220 Sisters of Christian Charity joined with hundreds of parishioners to celebrate their 100th Anniversary at St. John’s with a Mass and dinner. On June 15, 1981, after the retirement of Father Fox, the Rev. Frederick Sattler took on the responsibilities of running St. John’s. Although he was here only three years, Father Sattler oversaw the difficult task of having to close the school, which was being consolidated with St. Patrick’s into All Saints School in 1983. April 29, 1984 was a day filled with many emotions as the priests and parishioners honored the Sisters of Christian Charity with a Farewell Tribute of Thanksgiving for 108 years of service to St. John the Baptist Parish. About 120 sisters joined the local community for a concelebrated Mass of Thanksgiving with Bishop Thomas J. Welsh as the main celebrant, followed by a dinner at Hillcrest Hall in Minersville. St. John’s Convent closed as a convent on July 15, 1984, two months after Father Sattler turned the parish over to Father Donald H. Henry. Together with Sister Judy Baldino, Father Henry’s pastoral assistant, St. John’s turned its’ face to the 150th Anniversary with renewed vigor to promote communion with God and with one another. Shortly after arriving in Pottsville as St. John’s thirteenth pastor, Father Henry laid out his intention to rehabilitate the physical, financial and spiritual condition of the parish. 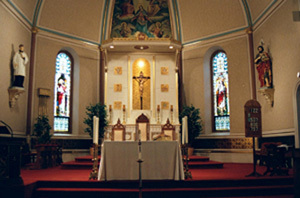 A Parish Council was formed and held its first meeting on July 8, 1984; the liturgy was updated; the sanctuary was redecorated – the most noticeable change being the addition of the striking brass pulpit and alter acquired from the former English Lutheran Church in Pottsville – the candles were re-bronzed and the chairs reupholstered; renovations were begun in the rectory; a charismatic prayer group was formed, and a cemetery committee was established which took on the overwhelming task of establishing burial and grave ownership records, of which there were none, and revitalizing the perpetual care fund established in 1912. The following year changes continued as the parish began to grow again. The year 1985 saw the renovation of the closed school, which in turn was rented to the diocese for Operations Plus, a special education program; and the renovation of the convent, which was then rented as a group home to Turning Point, a county social agency. For the first time, the parish dramatized the Stations of the Cross, a commemoration that has endured as an annual parish event that continues to this day. In 1990 several other improvements were completed in the parish. An exhaust system was installed in the church, the pipe organ received a new blower and the Russell Building and school parking lots were repaved. New windows and ceiling fans were installed in the Russell Building by Ralph Kern and Donald (Doc) Bound. Renovations began on the lower Tenth Street entrance of church: a new oak door, carpeting and tile were installed. Three special projects were completed: the church basement was refinished as a parish hall and named in honor of Father Longinus; Dave Naydock, a local artist, painted a mural depicting the Return of the Prodigal Son which may be seen at the top of the Tenth Street stairwell; new oak doors were installed at the upper Tenth Street entryway (as well as the lower door mentioned earlier) in memory of Marie Murphy, Saint John’s men’s choir director and organist for 35 years. More important than all the temporal events listed here, however, has been the spirit of Christian fellowship nurtured at St. John’s by all sorts of people in all varieties of circumstances for more than one and a half centuries. That spirit has been reflected in the events we record here as history. A Family Church in Pottsville PA© 2019 Saint John the Baptist Catholic Parish Family, All Rights Reserved.